Can anyone speak to or point to any resources about maintaining a semi-dwarf fruit tree as more of a dwarf size, to allow for manageability from the ground, or from only a few steps up? In particular I’d like to keep a green gauge plum tree to 10’ or less, and most of these seem to come as semi-dwarf. I’m curious how successful I can be with that and how active I would have to be with pruning. I’m located near Denver Zone 5 (now labeled 6a, but I don’t quite buy it). Ross, I don’t think you’ll have too much problem. When the tree’s central leader reaches 8 feet cut back anything above that in the dormant period. It will come back with several shoots from the cut. In July or August, when you’re doing summer pruning, remove all of these except the weakest. Repeat next season. While all pruning is ultimately dwarfing, winter pruning stimulates a flush of growth but summer pruning much less so; when you remove leafy growth you’re depriving the tree of nutrients that it would store in its root system for next year. Summer pruning is more dwarfing more quickly than winter pruning because it gives the tree less time to recover before it shuts down for the winter. With less stored food it will be better behaved in the spring. Also, train your tree’s scaffolds to horizontal as soon as you can, and let it fruit young. Just my two cents worth - others may have better info. It makes it easier if you tie limbs down to horizontal, then the tree calms down sooner and starts fruiting. But yes, with proper pruning technique its not all that hard. Thanks for the input, and it doesn’t sound that hard to maintain. Given Colorado can have some harsh winters, does the summer pruning with less food in the roots leave it more susceptible to it being less hardy during the winter? I’m guessing it would. I don’t know the answer to that but I’m guessing it won’t be a problem. I think you’ll figure out how to balance things in a season or two. Plums tend to be pretty forgiving of pruning errors, at least in my limited experience. 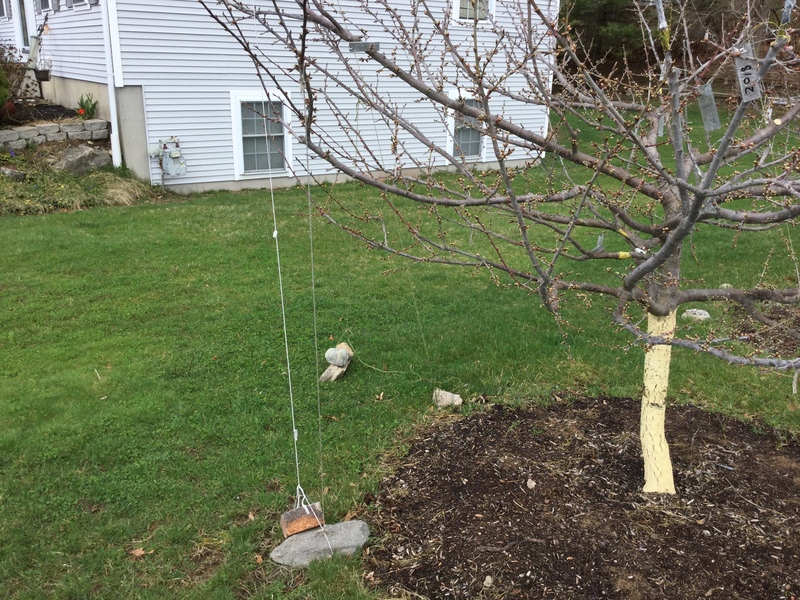 Can you share steps how to tie young tree limbs down so they do more horizontal growth? I’ve tied limbs of various fruit trees. Choosing limbs to tie down in the spring is recommended because they are new shoots and quite bendable. Figure out which direction you want a particular limb to go in accordance to the rest of a tree. Make it looks evenly balance would be ideal. Different people use different materials to bend tree limbs. Where we are, we have more rocks of various sizes up the wazoo. I use twine and rocks. Of all fruit trees I’ve bent, pears have most brittle wood. Broke many limbs of pears and a couple of plums. Apples are the best. Peaches are not bad esp. young shoots. I have seen people using bottles filled with water. As long as those bottles are heavy and sit firmly on the ground, they work. Don’t let bottles hanging and blowing in the wind. With wind gust, it could cause damage to those limbs or passers-by. Sometimes I need more than one rocks to bend down older limbs. This is my Euro plum.